There are lots of benefits from growing your own food! You know how it was grown, when it was harvested, and that it’s going to taste better than supermarket produce. Aside from these obvious benefits, there is the very sensual, and sensuous, experience of harvesting your own food–tactile, olfactory as well as the anticipated gustatory experience. I harvested my first potatoes today. The smell of the earth as you dig them–newly turned, feeling cool to the touch, and the smell of the potatoes (yes, you can smell them), and anticipation of the taste are things you’re not going to experience when you buy them in the grocery store–not to mention that you can’t get new potatoes unless you go to the farmers’ market. 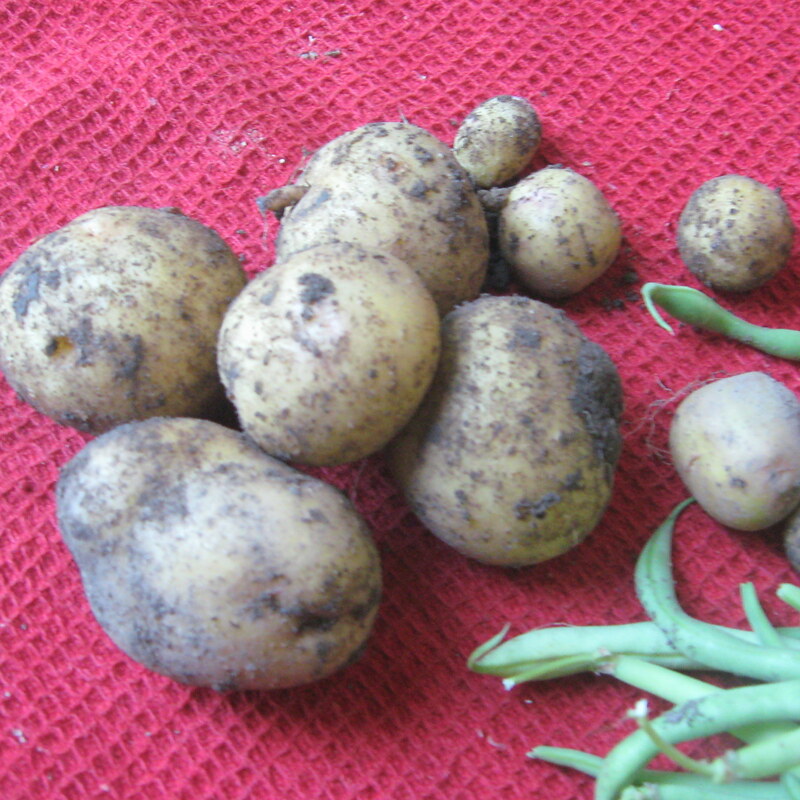 The other advantage of growing potatoes is that you can skulk out to the potato patch and gently unearth some of the marble-sized ones whenever you want–you can do that without uprooting the entire plant and treat yourself to something that you’re not even likely to find at the farmers’ market. 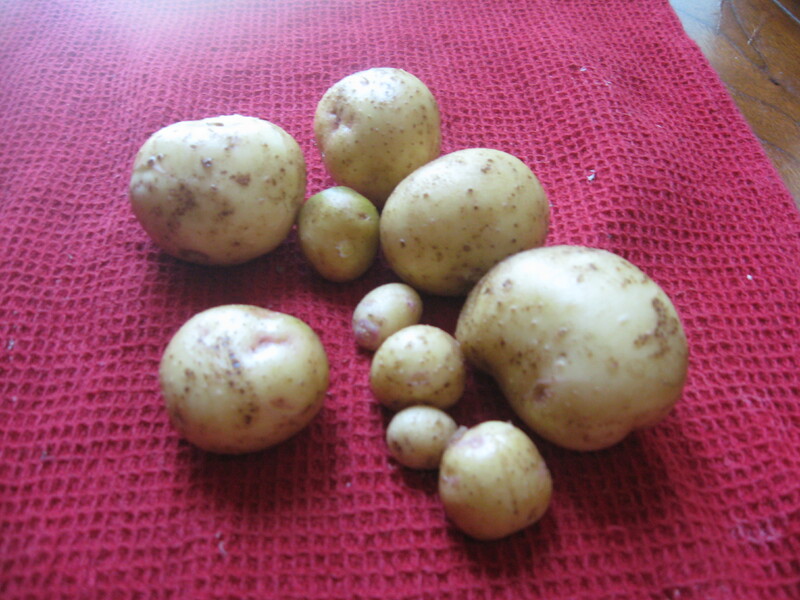 Now, I’m not advocating that you should try to grow enough potatoes–or any other vegetables–to meet all your needs since that’s not feasible for most of us urban gardeners; however, it’s worth growing a few just for the total experience of having new potatoes. I’m certainly not going to grow things that are readily available at the farmers’ market inexpensively–like summer squash, eggplants, or other basics. I’m going to reserve my gardening efforts for the special treats–like a hill of potatoes, or radishes, or haricots verts. I recently purchased The food lover’s garden: amazing edibles you will love to grow and eat by Mark Diacono (See Bibliography). It’s worth a trip to the library to check this one out and read it–especially if you’re contemplating a foray into gardening. It will make you think about what you really want to expend time and effort on for your garden. The philosophy is that of a true food lover! It’s full of information on somewhat esoteric veggies that you’re certainly NOT going to find in the supermarket, and may not even find at your local farmers’ market. The philosophy is that you should grow the things that YOU really love to eat. There are a lot of really wonderful vegetables and fruits that aren’t readily available–salsify, scorzonera, kohlrabi and the like, as well as some that are just much better harvested as you’re ready to use them (brussels sprouts, broccoli for example) that will make you feel like it’s a different vegetable than what you brought home from the supermarket! These are the ones that deserve space in a small garden, and the time and effort required to grow them. In my case that includes at least a hill or two of potatoes (you can grow the in a large container) so that I can have the total experience–from planting, sneaking a few very small potatoes early to go with the fresh garden (English) peas in a luscious cream sauce, or larger new potatoes in some other simple fashion. That means that I’m going to continue buying my yellow storage/cooking onions from other people–though I do have my little clump of “walking” onions, and some tiny carrots to give me a special treat when I want carrots featured; but the carrots for sofrito or mirepoix will continue to come from other people’s efforts. 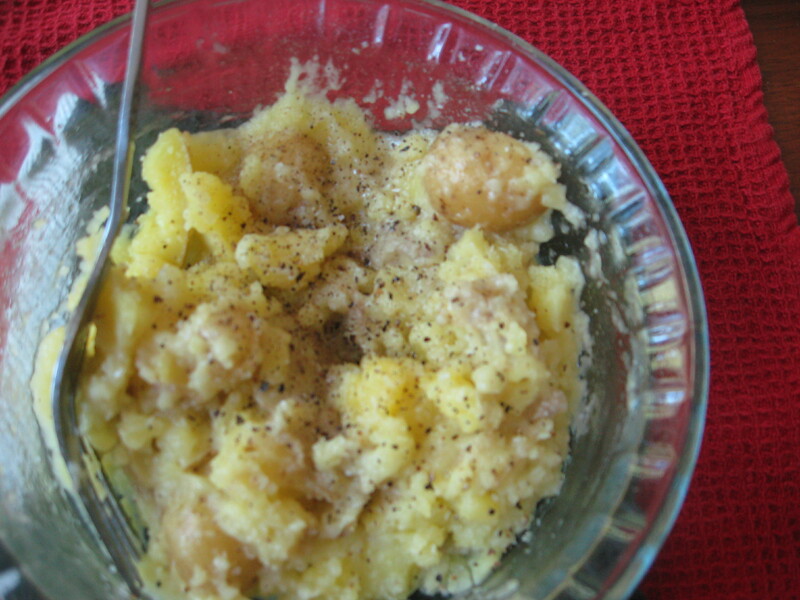 The baking potatoes that I use will also come from somewhere other than my garden–they’re basic, inexpensive, and readily available at the farmers’ market or supermarket with the organic produce. I will grow some that are unavailable commercially because they’re something I love to eat.